Chris Snidow - "Daughter of God: Joan of Arc"
Multi-instrumentalist Chris Snidow has been playing music since the late 1960's, having been based through the years in Texas, California, Holland, France and northern Africa. He has played various styles of music and has been in bands that have opened for the likes of Ike and Tina Turner, Sonny & Cher, The Mothers Of Invention, Chuck Berry and the Nitty Gritty Dirt Band. 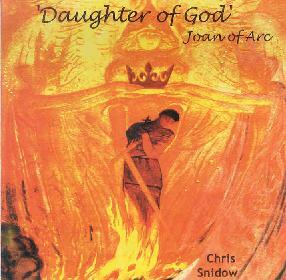 Daughter of God: Joan of Arc is Snidow's third CD. As the title suggests, this is a concept worked based on Joan of Arc, who at 17 years old is the youngest military commander - male or female - in recorded history. The music is contemporary classical performed in a symphonic progressive rock style that often borders on New Age. Some Aural Innovations readers might consider the music to be a bit on the "fluffy" side, but Snidow does an outstanding job of bringing the story of this remarkable women to life with music that is spiritually uplifting, including powerful melodies that often reach peaks of full symphonic majesty. Snidow also injects elements of ambient space into the mix which gives things a nice cosmic kick. Each track is preceded by the words of Joan, spoken in French by Snidow's wife, Catherine Henon. Snidow points out in the liner notes that the listener can program his/her CD player to only play the voice or musical tracks, though personally I came to enjoy the narrative introductions (Snidow includes English translations in the CD booklet) and consider the narration and music to be an integral part of the larger whole. In fact, Snidow is such an accomplished musical storyteller that while the music certainly stands on it's own merits, following the narration made for a much fuller immersion in the story and conjured up vivid images of the unfolding events. A impressive effort and one that can be enjoyed with eyes closed under the headphones or more actively following the story. For more information you can email Chris Snidow at: cowrind@ev1.net. Contact via snail mail c/o Chris Snidow/Cowrind Studios; 9320 Biscayne Blvd; Dallas, TX 75218.